HSM - So who needs an evacuation chair? Home> Premises >Risk Management >So who needs an evacuation chair? Whilst the Fire Service rescue people, they are not there to implement building emergency procedures. No-one should be left in a building in the event of an emergency and, according to Globex Europe, the culture of depending on the emergency services must change. The company's simple reminder is that if you allow people in you must be able to get them out. If this can not be achieved due to lack of resources, whether that be personnel or equipment, access should be restricted. Whilst this may not meet the requirements of the Equality Act 2010 and may leave responsible persons open to claims of discrimination, fire and safety legislation over rules these requirements. Forward planning is essential to ensure compliance with today’s requirements. Gone are the days of members of staff carrying someone up or down stairs for a variety of reasons, primarily the risk of injury to both the person/s carrying and the person being carried, claims of personal injury and various health and safety/manual handling requirements. In most workplaces, to assist with compliance is current fire safety legislation, primarily the Regulatory Reform (Fire Safety) Order 2005, clear documentation including a fire safety policy and management plan, fire risk assessment, emergency procedures, information for the fire service and a fire safety log book should be in place. Personal Emergency Evacuation Plans (PEEPs) and General or Generic Emergency Evacuation Plans (GEEPs) are also required to assist with compliance and forward planning. Ambulance chairs, transport chairs, transit chairs and carry chairs are names for lightweight foldable chairs that can be used to transport non-ambulant persons across a flat surface, some can also be carried up and down stairs but may require two or four people to do so. These types of chairs should not be confused with evacuation chairs. Evacuation chairs can be used as wheelchairs across a flat surface and have the added benefit of enabling one person or two people to transport another person down stairs. Evacuation chairs usually have two skis with rubber belts that provide a smooth friction controlled descent when traveling down the stairs. 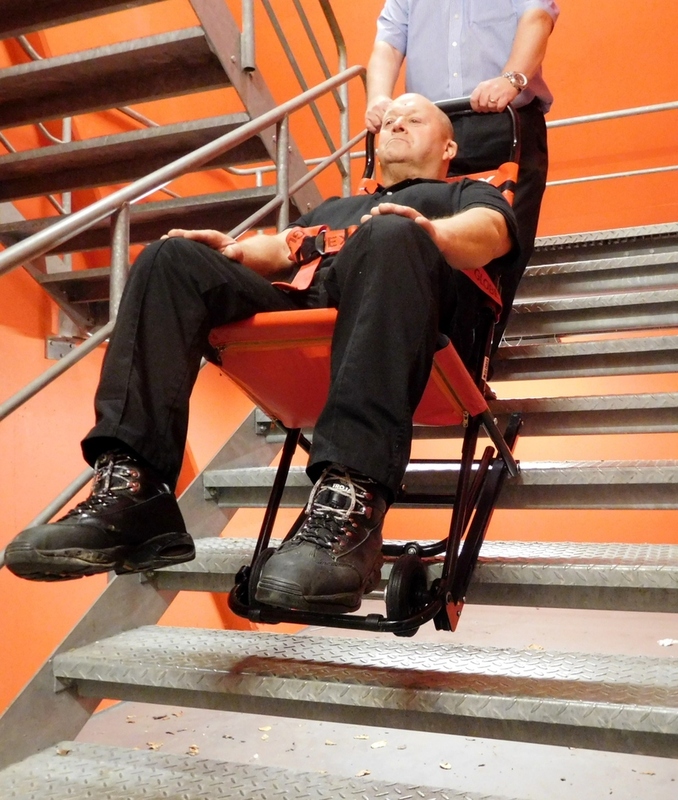 Whilst most evacuation chairs are designed for one person operation, Globex recommends that two people should be present, primarily to assist the operator by opening doors on exit routes, to provide additional control of the chair if required - especially on tight staircases - and also to provide reassurance to the user of the chair. Some evacuation chairs also have carry handles that enable two people to carry the chair upstairs from basements and over obstructions. staff should have training in their correct use but there is no legal requirement for staff to use them, staff are not firefighters. However, with an evacuation chair it is not optional, trained personnel must be prepared to use the equipment and suitable and sufficient procedures must be in place to ensure the safe evacuation of all users of the building whenever it is occupied. More businesses are considering online training which is great for raising awareness of various fire safety and health and safety requirements and can also provide huge cost efficiencies and minimise disruption in the workplace. However, Globex believes hands-on, face to face training using an evacuation chair is essential for providing confidence to operators and reassurance to users. Using an evacuation chair can be very different when a fire alarm is sounding as opposed to a training environment. All training should be recorded in a suitable log book and ideally certificates of attendance provided by the approved trainer. So, the fire alarm activates, everyone leaves the building by the nearest available exit and reports to the designated assembly point and designated members of the fire team investigate the cause of the alarm activation. Depending on a building's fire strategy, emergency procedures and PEEPs, non-ambulant persons generally make their way to the predetermined refuge area, a place of relative safety, with a designated buddy/trained operator in the use of the evacuation chair who has knowledge of the PEEP. They should then communicate with the building fire safety management team via a refuge communication system or walkie-talkie to confirm if there is a fire or not. If it is confirmed that there is no fire or risk to the non-ambulant person there is no need to transport them down the stairs. They can simply wait in the refuge area with their buddy until the fire alarm is silenced and the all clear is given.